This result is published in the issue of June 25, 2007 of Publication of Astronomical Society of Japan. Note 1: Elements heavier than iron are produced by the capture of neutrons by atomic nuclei. This capture process terminates at lead (Pb) and bismuth (Bi) if it occurs on long time-scales inside a star. The heavier elements can be produced only by events with very short time-scales (shorter than one second) that enable the process to continue through unstable nuclei. Isotopes of thorium and uranium (232Th and 238U, which have isotopes with relatively long lifetimes), remain after such processes (Figure 1). Models of element synthesis during the supernova explosions predict that the abundance ratios of actinides with respect to other stable elements heavier than iron are very sensitive to the environment of the explosion, such as the entropy and the ratios of protons, neutrons and electrons. Note 2: Previous studies for this star have shown that the abundances of metals such as iron and calcium are about 30 times lower than in the Sun, while the elements heavier than iron are as rich as the Sun's. The measured abundance ratios of heavy elements such as barium (Ba) and europium (Eu) suggested that they originated in an explosive event, rather than in the slow process of element creation that occurs inside stars. This is clearly confirmed by the detection of thorium. Note 3: Actinide abundance ratios may be applied to measurements of stellar ages. Thorium (232Th) has a half-life of 14 billion years, and the abundance decreases in older stars. The thorium abundance ratio measured for the star in the Ursa Minor dwarf galaxy is as low as that found in the oldest stars in the Milky Way, suggesting that this star could be at least 12 billion years old. However, the measurement error is still large, and there is an uncertainty of the estimate of initial abundance of thorium produced in the explosive event. 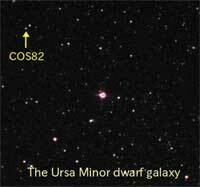 Detection of uranium is needed to determine the accurate age of this star. Figure1: This chart shows the heaviest elements and their atomic makeup. Those with the most numbers of protons and neutrons are in the upper right portion of the chart. The isotope 232Th has a half-life of 14 billion years and decays to 228Ra by emitting an alpha particle (a helium nucleus), which is called the alpha decay (the blue arrows show the "direction" of decay). The isotope 228Ra decays to 228Ac and then to 228Th by emitting an electron (so-called beta decay; red arrows). Such processes terminate at the stable nucleus 208Pb. The isotope 212Bi decays through both alpha and beta processes that have similar time-scales for this nucleus. Since the unstable nuclei exist between actinides, including thorium and stable nuclei like lead and bismuth, explosive events such as supernovae are required to produce actinides. 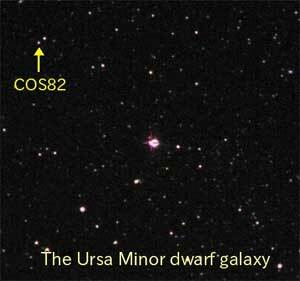 Figure 2: An optical image of the Ursa Minor dwarf galaxy from the Digitized Sky Surveys (DSS)* (14 arcmin by 14 arcmin) and the target star COS82. The morphology of the galaxy is not clear due to the low stellar density and the relatively short distance to the galaxy (220,000 light years). * The Digitized Sky Surveys (DSS) were produced at the Space Telescope Science Institute under the U.S. Government grant NAG W-2166. The original photographic data based on the Second Palomar Observatory Sky Survey (POSS-II) made by the California Institute of Technology with funds from the National Science Foundation, the National Geographic Society, the Sloan Foundation, the Samuel Oschin Foundation, and the Eastman Kodak Corporation. 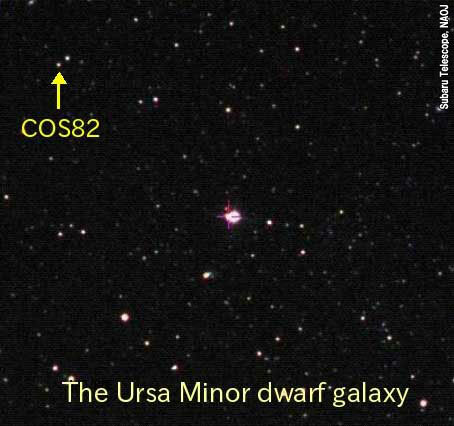 Figure 3: The spectral line of thorium found toward the star COS82 in the Ursa Minor dwarf galaxy. The decrease of the flux shown by the arrow indicates the absorption of light by thorium ions at the surface of the star; i.e., the stronger feature means a higher abundance of thorium. This star is a red giant with a visual magnitude of 17. The spectrum was obtained with the Subaru Telescope's High Dispersion Spectrograph with exposure time of three hours.